Easy Peasy:Just add water, vegetables & salt, a few days and voila perfection! Do-It-Yourself Vegetable Fermenting Kits! Fool proof fermenting every time...in just 4 days! 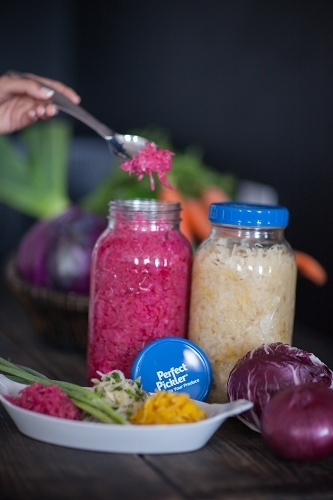 In the comfort of your own kitchen begin to make the tastiest, healthiest fermented vegetables you can eat - simply. Unfortunately, most of the commercially available pickles and pickled products are pasteurized. They are missing key beneficial bacteria and instead all you get is a lot of salt in a vinegar solution. You can use cucumbers, beets, cauliflower to make your own pickles. AND , the difference in the taste and health benefits of lacto-fermented sauerkraut can't be beat. 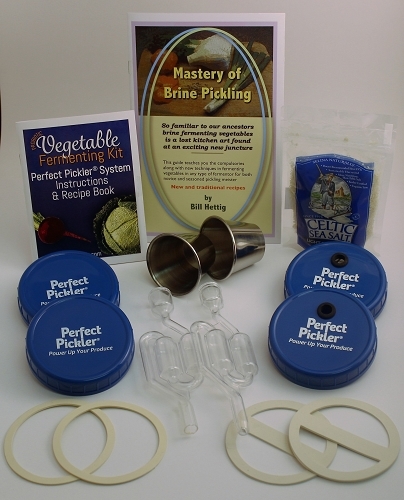 Fermentation Value Package: This Kit provides 2 Perfect Pickler® Vegetable Fermenting Kit Systems for easy, do-it-yourself vegetable fermenting. 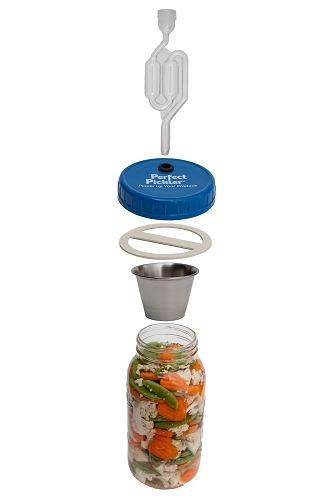 The perfect solution for those who want to ferment more than one jar (or two different recipes) at a time. Foolproof fermenting each and every time. Our Jar Tops fit onto wide mouth mason jars to create an endless supply of fresh, raw, affordable fermented (pickled) vegetables (enzymes, probiotics and more…) in just 4 days! NO cultures, NO cooking, NO canning. Just add filtered or spring water, vegetables and sea salt (1/4 lb included). Our ClearView AirLock and our NoSpill Gasket (Patent Pending) create an airtight seal to prevent unwanted microorganisms from spoiling the recipe and our Brine ‘Catch’ Cup prevents leaking. Includes recipes and instructions. Domestic and imported parts. Wide Mouth Jar Kit fits ½ pt, 1 pt, 1 ½ pt, 1 qt and 2 qt wide mouth jars (not included). Includes: 2 ClearView AirLocks, 2 Wide Mouth Brine ‘Catch’ Cups, 2 Wide Mouth Fermenting Lids, 2 NoSpill Fermenting Gaskets, 2 Wide Mouth Storage Lids, 2 Storage Gaskets, ¼# Salt, Recipe Book, Mastery of Brine Pickling 24 page book!
" If you enjoy pickled foods, I urge you to make your own using organically grown vegetables. It's not difficult. Recently, I've been using a device called the "Perfect Pickler," available online, which makes the process easy and fast; you get really good pickles and kimchi in just a few days."